Dolsot Bibimbap. 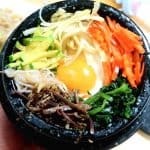 Bibimbap served in a scorching rock! Do you hear the crackling?! Split the roots into smaller pieces with your fingers (use a knife if needed). Then cut the roots into a finger-sized length. Place the roots into a mixing bowl. Add 1 Tablespoon of salt and rub it into the roots - you will see them wilt and get soft. Let it rest for 5 minutes. Squeeze out the water from the roots with your hands. Put frying pan on a medium high heat. Put some oil into the pan. Once pan is hot, quickly stir-fry the pieces for 2-3 minutes. Season with salt. Set aside. If you bought dried ones, soak them overnight in a bowl with cold water. If you bought pre-soaked ones, give them a rinse under cold water. Squeeze out the water from the bracken. Cut them into finger-length pieces. Place pieces in a mixing bowl. Mix in sesame oil, soy sauce and minced garlic. Put frying pan on a medium high heat. Put some oil in to the pan. Once pan is hot, quickly stir-fry the pieces for 2-3 minutes. Don’t burn them. Set aside. Cut the stems off the spinach. Put water into a pot and bring up to boil. Blanch spinach for 30 seconds. Squeeze water out of the spinach. De-tangle the spinach pieces and place in a mixing bowl. Add in minced garlic, sesame oil, salt. Mix that around with your hands. Put water into a pot and bring up to boil. Blanch sprouts for 1 minute. Cut carrot and zucchini into thin circular slices. Then cut those circles into thin strips. Put frying pan on a medium-high heat. Place in 1 teaspoon of sesame oil. Once pan is hot, you want to quickly stir-fry the carrot pieces for 2-3 minutes. Don’t burn them. Season with salt. Set aside. Then repeat the entire process for zucchini pieces. Pour some sesame oil into a small dish. Use a kitchen brush to wipe the sides and bottom of the dolsot with the sesame oil. (You can also dab a paper towel with oil for this). Then place a layer of cooked rice on the bottom. Then place an sunny-side egg on top of the rice (optional). Then arrange cooked veggies around the egg. Place gochujang sauce on top. Put dolsot on a medium heat. Leave on heat until you start to hear the crackle. Carefully (!!) take the dolsot bowl off the heat. Mix with spoon and enjoy! Squeeze out the water of the vegetables before frying. Use vegetables and include meat(s) of your choice! No need to stick to the script.